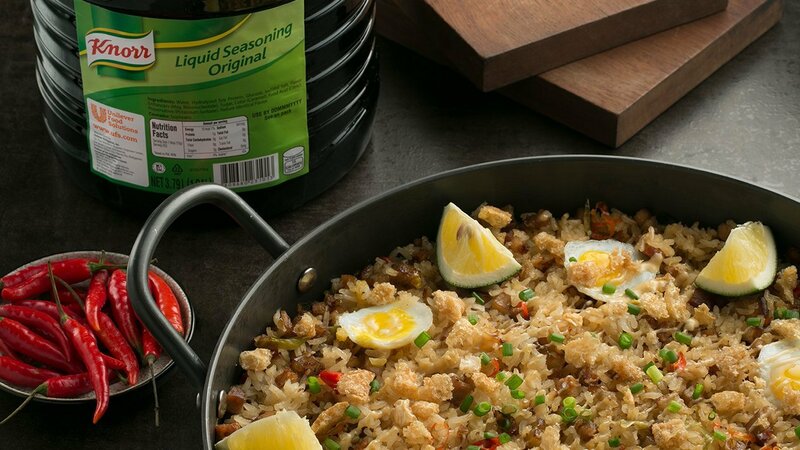 Serve something extra special for your diners with this Spanish classic made more delicious when made with Sisig! In a pan, sauté onions, garlic and mixed finger chillies in oil. Add Spanish chorizo, then sauté for a few seconds. Add liempo / pork belly (season with 30 ml Knorr Liquid Seasoning and 3 g Knorr Rostip Chicken Seasoning Powder), cook it until brown in color. Combine 3 cups water, 20 g Knorr Pork Broth Base and 15 ml Knorr Liquid Seasoning to make sisig stock. Add rice grains, then sauté until translucent then add stock. Cover with foil then simmer for 25 to 35 minutes. 1 minute before the paella is done, remove the foil then make 5 round indentions then place the cracked quail eggs in the indentions. Cover with foil and turn off the heat. Mix Knorr Liquid Seasoning and Lady's Choice Real Mayonnaise in a stainless steel bowl with a whisk until smooth and fully incorporated. Set aside in the chiller. Garnish it with lemon, sisig dressing and spring onions. Serve immediately.